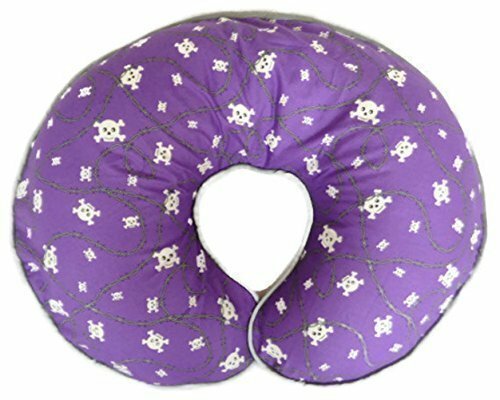 This nursing pillow cover is handmade using purple cotton fabric featuring white skulls and crossbones and barbwire on the top side with piping along the edge. Shown here with grey piping but color of piping can be customized. The back of the cover is made from solid black fabric with a zipper for easy removal. The cover is machine washable in cold wash and air drying is recommended. The nursing pillow cover is shown pictured on a Nursing pillow which is not included. The nursing pillow cover you will receive might be slightly different to one cover pictured due to the fabric repeat. View More In Back & Body Supports. If you have any questions about this product by Mommy's Little RockStar, contact us by completing and submitting the form below. If you are looking for a specif part number, please include it with your message. The Baby & Co. Mini Diaper Cake. Baby Shower Gift or Centerpiece.